We feel that multi-level ferret or rabbit cages, climbing branches, ramps, and ladders may be a good idea, but only if you take several precautions. We recommend avoiding the above situations because providing more floor space with accessories or toys is a much safer alternative. Hedgehogs are quite capable of climbing up, but they are not so graceful in the descent. Their toes are fairly short and are not made for grasping and hanging on. Their legs are relatively small in comparison to their body mass. They simply do not have the strength to resist the pull of gravity. Their eyesight is very poor and so they have very little depth perception. The most natural way for hedgehogs to get down from a high place is to curl themselves into a ball and free-fall. Many claim that hedgehogs have naturally built in “shock absorbers” and that their spines will protect them in a fall. However, a hedgehog may still bruise himself or break a bone from an ill-fated fall. It has also been reported that spines can actually puncture backward into the animal. In order to provide a safe climbing experience some hedgehog owners use multi-level ferret or rabbit cages and line the ramps with plastic mesh or cover with an all-purpose carpet. 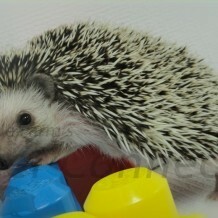 This keeps little feet from being injured but might be quite messy if the hedgehog is not litter-trained. The bottom pan of multi-level cages should be padded with several inches of shock absorbing bedding. Most hedgehog experts would agree that tree branches and ladders are NOT a good idea.